The expanding area art and creativity…work…space…. it’s not really work, though. Now that I think about it more, it is closer to createspace. And, as I mentioned in a previous post, why confine myself so much into one specific place? I realize that in my home there are separate areas for doing different activities, but maybe just as I have been meditating on the different parts of myself/myfamilylife/myworklife…myARTLIFE, it seems that it’s best for me when I can integrate these parts. For now my physical artistic life is expanding, and it’s not easily containable, and that’s ok.
Just as I was headed towards an art routine — at least once a week — my studio space arrangement evaporated. The group experienced funding issues, and announced its sudden closing until further notice… (sad face.) While I was genuinely disappointed, part of me also accepted that this is merely a move in a different direction. I made arrangements to modify my membership/rent agreement, pick up my retail items, and advised myself to look beyond that space to other possible outcomes. As I was sitting in the empty cafe area, I saw a blinking neon key sign across the street. I had not noticed it before during the numerous previous visits. I googled “key symbolism”… “Keys are symbols of opening and closing.” I do love me a sign from the Universe. Then, as the flow of time proceeded into the winter holiday season my regularly scheduled me-art-time derailed. I will concede that a dedicated space away from my home sphere is more productive, but at the same time not having a studio space should not stop me from creating more frequently. So, I’m somewhere between dedicated studio time with an arty community and creative solitude. 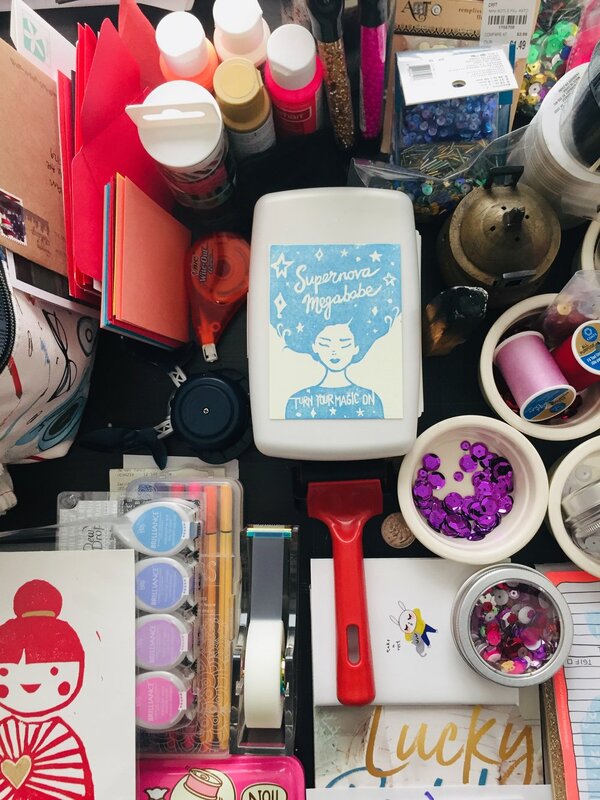 I see the block that I imposed on myself by creating a rule of finding “just the right space.” Now, I’m thinking about a more nomadic approach to pack a bag (or two) of supplies&tools and make a mobile studio. I could do a tour of coffee shops, maybe a library… Over the last couple months, like Dorothy leaving OZ, I realized that studio/home is really in my own backyard, and that ultimately I can make it where I choose, because I bring my creativity with me wherever I go. At this time my arty adventures, blogging, creative pursuits…. are not a major source of income (I did sell a handful of pieces in the last month, so I can actually claim my art-work as a possible income stream - if only a droplet… for now.) So, I do have a day-job and other in-real-life-responsibilities (IRLRs) that require time, effort, and thought. However, while it seems there is no limit of these IRLRs, I have realized if I don’t make it a priority to heed my creative spirit (or my health, family, internal compass, ….) some terribly unbecoming behaviors will make themselves known. It became apparent to me that I needed to reclaim time for ME, MY ART, MY SOUL. Now I schedule at least one 1-hour self appointment in a week, to do something dedicated to my own art and well being. For example, on a weekday, I have recently made the effort to get up early, pack my art bag, and get to the art studio and spend ONE HOUR making, just me doing something creative. Then when my timer goes off, I pack it up, and drive to the office. I have found that this single sacred sixty minute self allowance brings joy and expansion of spirit. It is indeed true, “if mama ain’t happy, nobody gonna be happy.” I will concede that the initial preparation might need a push, but once it becomes more routine, the benefits leave me wondering why I didn’t figure it out sooner?! And then I think, what other wondrous hours/portals/opportunities await if I apply this to other areas in my life? …. to be continued…. In the last year, I noticed that I had been unconsciously obligating myself to do things that I thought were necessary…. and time consuming. I wondered why I didn’t have time to make art, or be creative, or just pursue more fun. One day the oracle of Instagram (again) showed me a little story about a person that said “FTS… and lived happily ever after.” I added the revised text to this print, and voila! a new mantra. So now, when I catch myself feeling my creativity in tension with another task, I consciously make the choice to move towards what serves the greater good, and often I tell myself this little tale and get making. new website! For so long I waited to have all the components ready to post, to set up, to sell, etc…. 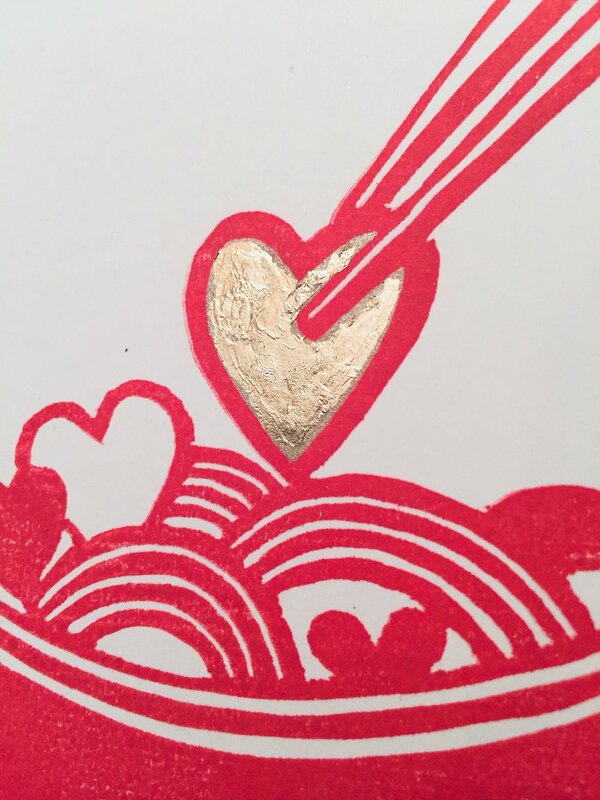 then on a spontaneous spark prompted by a divinely timed Instagram post via rockpaperscissorsgoods and rarepress I signed up for a printmaking class. This little bibi inspiration materialized (a self portrait perhaps? ), and I’m in love again with paper arts! Since then, so many ideas have floated into my head and I became a member at a local art center to make and sell! It has been a lesson in just start, jump in, swim around, follow joy….